Bernice came to me by way of my sister-in-law Jen, who has been my chicken source (and mentor) since day one. 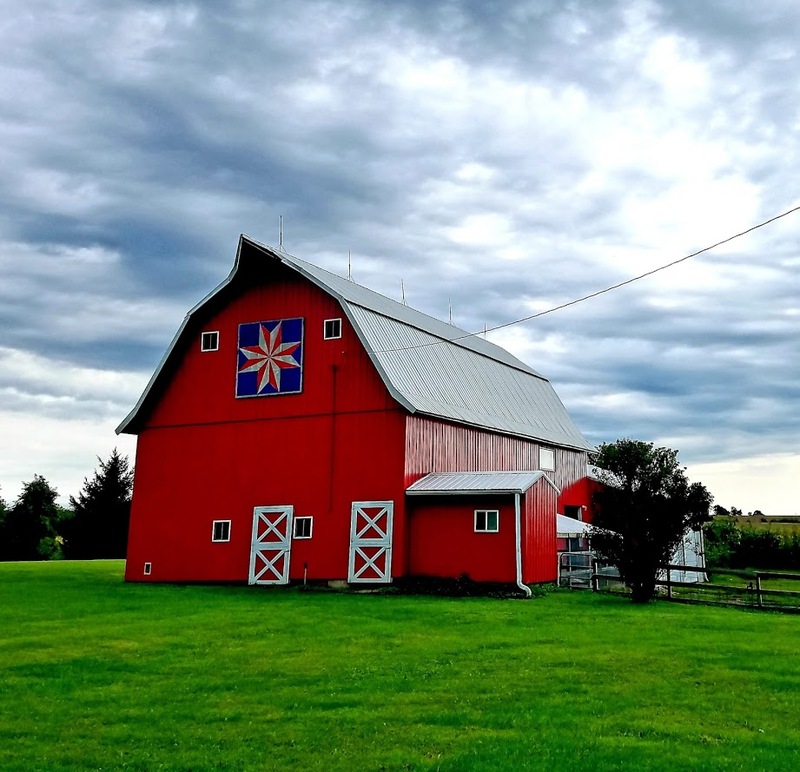 Jen lives on the cutest little hobby farm north of Cedar Rapids, where she keeps sheep, mini-donks (yes!) and, of course, chickens. Every few years, Jen orders a batch of baby chicks from the hatchery, broods them out, and gives me however many I need for my flock. Mabel, Hazel and Petunia (and Penelope, may she rest in peace) were from the batch six years ago, and Marigold and Betty are vintage 2015. But the girls are getting up there in years. Only one of them is laying right now, the others are molting, and several of them undoubtedly have reached henopause. So when Jen called me up the other day and asked if I wanted a chicken, I didn’t say no. I could use another egg-layer, after all, and I had room for one more in the coop. And then Jen told me the story, and I had to say yes. Jen’s mother-in-law has a friend whose mother recently died. The mother loved chickens – at least the ceramic kind – and the daughter had the daunting task of disposing of her mother’s vast chicken collection, which she did via an estate sale. Once she finally got rid of the chickens and cleared out the house, the daughter returned for a final walk-through before putting the house on the market. And that’s when a little red hen strolled into the yard. Nobody knew where this little hen came from, but she was friendly and had no problem being picked up. She seemed happy and well-loved. She had to belong to someone. The daughter canvassed the neighborhood, going from door-to-door in a several block radius from the house. But she couldn’t find anyone who kept chickens, much less who had any idea where this chicken belonged. By now, the daughter was starting to think the hen was her mother reincarnated, coming back to haunt her for selling off the ceramic chicken collection. So she named the hen Bernice, after her mom. The daughter set up a little pen for Bernice in the garage, and placed an ad on Craigslist. But, sadly, no one claimed Bernice (although the ad did get a few jokey responses along the lines of how chickens are shifty and can’t be trusted). Eventually, the daughter gave up trying to find Bernice’s rightful owner. She had to get the chicken out of the makeshift pen in the garage. And Bernice needed to be with her own kind. That’s when Jen and her home for wayward animals came into the picture. You see, homeless animals always seem to make their way to Jen’s house, be they cats or dogs or the occasional llama. And now a stray chicken. And so Bernice arrived to Jen’s. Jen assessed her to be young and healthy … and far too tame to fit in with Jen’s big barnyard flock. No, Bernice clearly needed to be a part of a backyard flock where she would be spoiled and cuddled and hand-fed meal worms. And that’s how I ended up with Bernice. And she may or may not be somebody’s reincarnated mother. 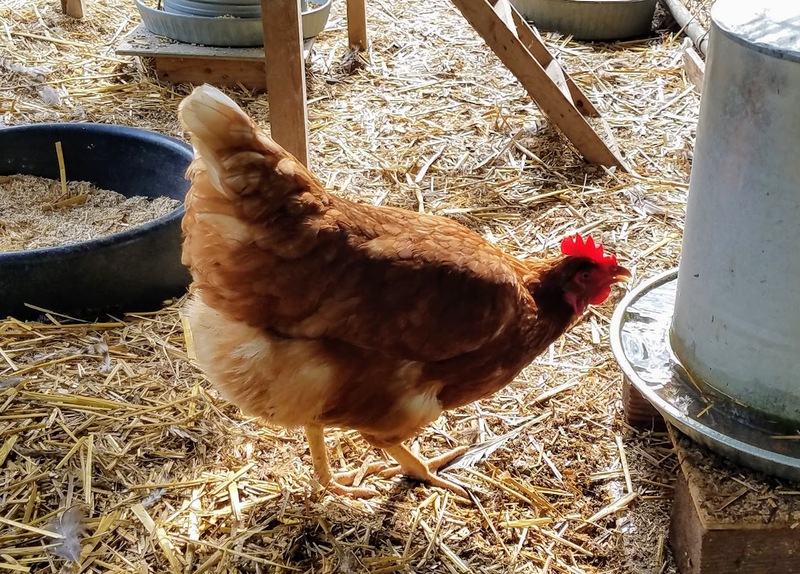 Bernice appears to be a New Hampshire Red, which is similar to the popular Rhode Island Red breed, but with a lighter reddish-brown color and a higher tail carriage. The American Poultry Association first recognized the breed in 1935. 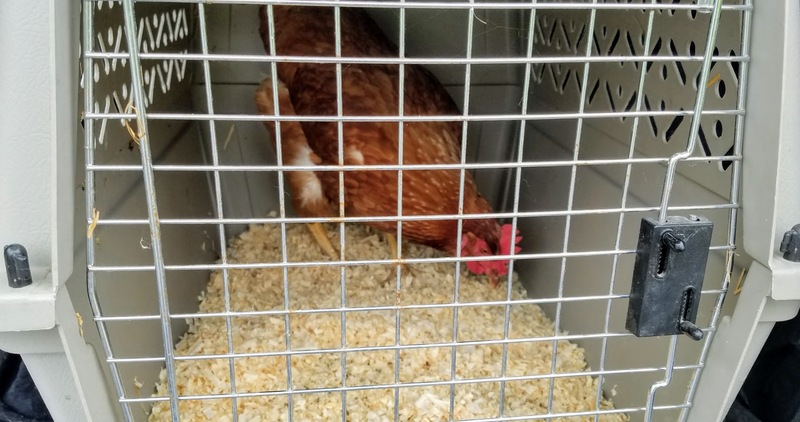 New Hampshire Reds are known to be friendly, calm birds suitable for backyard flocks, and that certainly has been my experience so far with Bernice. She has adapted well to my other five hens, and they to her, with a minimum of drama. While New Hampshire Reds are both heat and cold hardy – great for my Iowa climate – I will have to be mindful of Bernice’s large single comb, which will be susceptible to frostbite in winter. All of my other chickens have rose combs so frostbite hasn’t been much of a concern to me until now. While I can’t be certain of Bernice’s age, I suspect she is fairly young. Her toenails are short and she is showing no sign of molting even though we are into October. Hens typically don’t molt until their second autumn, so I’m guessing this is Bernice’s first autumn. Hopefully that means she will keep laying eggs through much of the winter. And hopefully that means she’ll be with me for many years to come. I’m counting six chickens now! 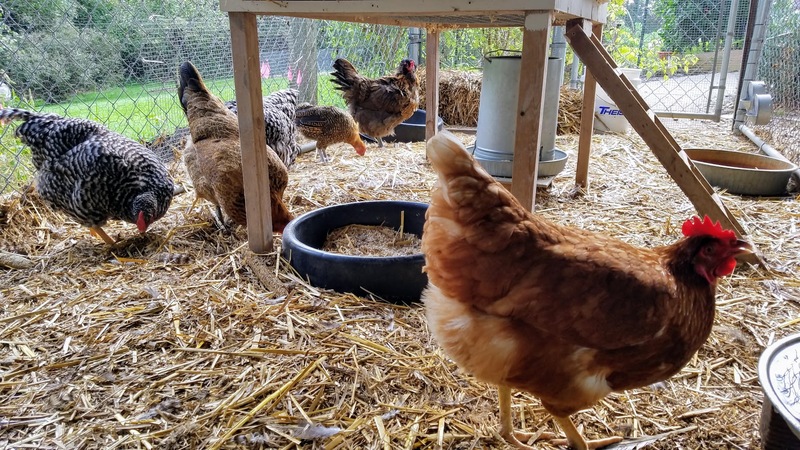 This entry was posted in Raising Chickens and tagged backyard chickens, chickens in winter, molting, New Hampshire Red, rescue chickens, suburban chickens by Deborah Neyens. Bookmark the permalink.